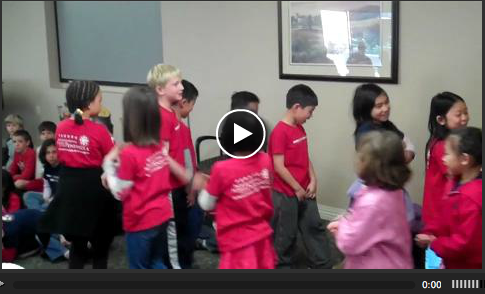 Recently, Miss Tracy took her 2nd graders to a local retirement home to bring music and cheer to the elderly residents. Miss Tracy said of the field trip, "it was a big success! The students sang wonderfully, and interacted very well with the seniors following the performance." She continued, "this field trip was very enriching for the children, because it allowed for multiple experiences. First, it allowed the students to give something to the community, which is the primary reason for this field trip. The senior residents do not have younger students visit the home to perform songs very often, so this was a special treat for them. Performing songs is a wonderful way to give to the community, while allowing the students the opportunity to perform. The trip also allowed the children in the French and Chinese programs to get together and work on an important project. In addition, by singing songs in French, Chinese, and English, it allowed the community to have a glimpse into our special multicultural I.S.T.P. community. " Tracy believes this was "an added enhancement to the celebration of diversity, we had an unexpected event after the performance! One of the seniors who was very excited about I.S.T.P.’s 2nd grade appearance, approached all of the students and sang a short song to the them in English, Korean, Chinese. Following this the students interacted with the seniors by reading books. This interaction was also a special treat for the seniors, and I am proud of the way the students interacted with the elderly with both respect and confidence. They should be proud of the wonderful job they did!" Click here to watch a video of the performance.